Snap Inc. is doubling down on original content, unveiling a new slate of scripted and unscripted shows on Thursday morning — including a new daily afternoon news series from BuzzFeed — as the Snapchat parent company looks to continue its rebound from a tumultuous 2018. The still-untitled BuzzFeed news program is set to launch later this spring and will be hosted by a rotating cast of the outlet’s personalities. The show, like all Snapchat shows, will be between three-to-five minutes long, shot vertically, and will join nine other new original series Snap is releasing this year. Many of the series look especially geared towards Snapchat’s young user base; “Two Sides,” a scripted series from New Form that focuses on a young couple working through a breakup and “Commanders,” a scripted show on high school outcasts that discover a life-altering computer code. 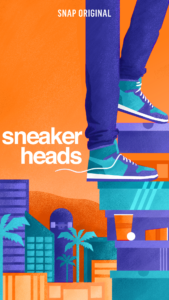 “Sneakerheads,” another scripted series that follows three college freshman navigating the quirky world of Los Angeles sneaker culture. All three shows will be out by June. Snap chief Evan Spiegel, who has mentioned a desire on past quarterly earnings calls to attract older users, championed the app’s popularity among teenagers and millennials while speaking at the company’s Partner Summit in West Hollywood on Thursday. Since going public in early 2017, Snap has struggled to find its footing, as underwhelming user growth and a continued assault from Instagram, its chief competitor, has hampered the company’s stock. A series of high-level executives leaving the company in the last year, coupled with a poorly-received app redesign, only added to investor concerns. Snap closed its first day of trading at $24.48 per share in March 2017; it opened trading at $11.23 per share on Thursday. Also Read: Snapchat Snaps Back: Is Fresh Content the Key to Snap's Longterm Success? But the Santa Monica-based company has seen its fortunes turn around, at least somewhat, in the last few months. The company’s stock has almost doubled since Christmas after Snap posted record sales during its Q4 earnings report. Snap also stopped losing users during Q4 after losing a combined 5 million daily users during the second and third quarters of 2018. It had 186 million users at the end of 2018. Finding compelling content that keeps existing users engaged and attracts new users is a key piece to Snap’s strategy moving forward — and the company thinks it found a few winners already. Snap announced that it is bringing back three series — “Endless Summer,” “Deep Creek,” and “The Dead Girls Detective Agency” later this year. Sean Mills, Snap’s head of original content, said “Endless Summer” — the Bunim/Murray produced docuseries following Orange County social-media stars Summer McKeen and Dylan Jordan — was a “hit series for” the company, “reaching over 28 million unique viewers” after being released last fall. Other new shows coming from Snap this year include “While Black,” an unscripted docuseries looking at racial issues, and “Compton Dreams,” a docuseries looking at three up-and-coming hip-hop artists from Compton. Snap unveiled its shows at the same time it introduced several new wrinkles — including a partnership bringing Stories, its trademark ephemeral feature, to Tinder. Snap users can now also use their Bitmoji on Venmo and Fitbit, the company said today.